May 9, 2018, 8:53 a.m.
Google announced a shiny new iteration of the Google News app on Tuesday as part of its I/O developer conference (here’s a good collection of all the other announcements from I/O, which runs until Thursday). Google News has started rolling out and should be available to basically everyone by “next week”; the app will replace the existing Google Play Newsstand and News & Weather apps. Here’s Google’s demo of what this looks like on mobile, if you’re not seeing the update yet. Google says it’s analyzing news and information using a “new set of AI techniques” (). — A five-story “For You” briefing, which responds to your reading habits, and includes local sources (“the more you use the app, the better the app gets”). The customized briefing was available in Google Play Newsstand as well, after a November 2016 overhaul of the news reader. 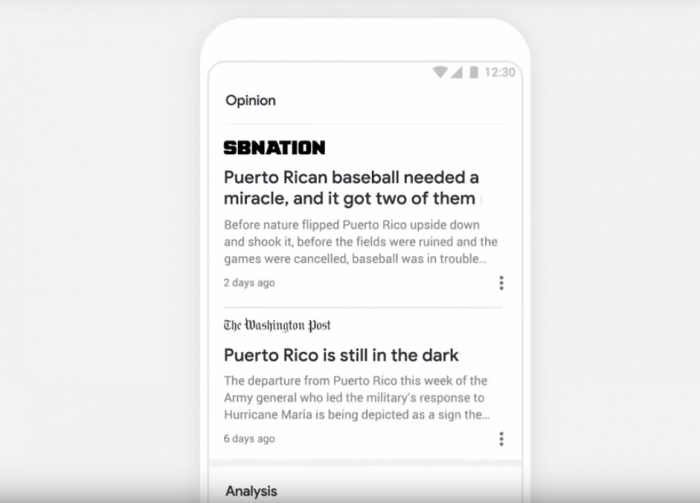 The first two stories are the same for all users, followed by three stories tailored to your browsing interests and behaviors, a spokesperson confirmed. — For those who don’t want the personalization, there’s a separate “Headlines” section, that highlights news stories and all that related fun stuff from above, but not personalized. Consider all your filter bubble concerns addressed. Google News offering an "unfiltered view of events from a *range of trusted news sources*"
An algorithm fed by a “couple hundred signals” surface these trusted sources, the Google spokesperson said. Interested in what Google approves as a trusted source in Google News. If it goes very strict like Apple News, or afraid of angering people like Facebook. — The “Newsstand” section of Google News features publishers more prominently, with subscription information. Google’s been working with some publisher partners on a “Subscribe With Google” payment process, and will be showing in a user’s search results relevant articles from news outlets the user is subscribed to. Wang, Shan. "Google News gets an update, with more AI-driven curation, more labeling, more reader controls (fingers crossed for no AI flops)." Nieman Journalism Lab. Nieman Foundation for Journalism at Harvard, 9 May. 2018. Web. 19 Apr. 2019. Wang, Shan. "Google News gets an update, with more AI-driven curation, more labeling, more reader controls (fingers crossed for no AI flops)." Nieman Journalism Lab. Last modified May 9, 2018. Accessed April 19, 2019. https://www.niemanlab.org/2018/05/google-news-gets-an-update-with-more-ai-driven-curation-more-labeling-more-reader-controls-fingers-crossed-for-no-ai-flops/.